Extortionate price? Toshiba charges a steep price for a simple 15-incher which does not even feature a dedicated graphics card. What are the advantages of the C55D? Does Carrizo-L change things in favor of the AMD APU? 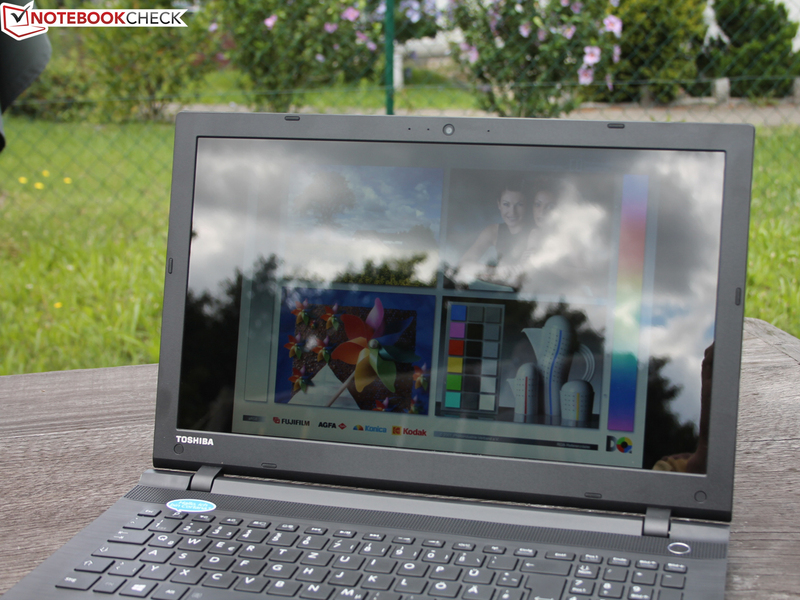 A reliable all-round notebook; that's what Toshiba says about the Satellite C55D-C-10P. Stylish design, optimized performance, optionally also with SSD and even high-end stereo speakers with Toshiba sound optimization might sound appealing to buyers. Are these only grandiose promises or real buying incentives? The following test will show which. The test model comes with the brand new AMD A-Series A8-7410 (Carrizo-L). The top model is processed in 28 nm, belongs to AMD's entry-level segment and is supposed to compete with Intel's Pentium (Haswell, Bay Trail M) or Core i3 processors. As usual, the Radeon R5 (IGP) is important here. Can it outperform the HD Graphics? We have already scrutinized Carrizo-L in a dedicated article. A plethora of office or multimedia laptops for low demands compete in the 400 to 500 Euros (~$454 to ~$568) price range. 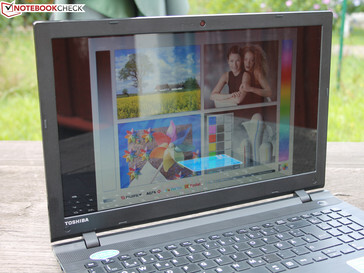 Currently, Toshiba charges an RRP of 699 Euros (~$794). The street price is 630 Euros (~$715) at the time of writing. Thus, the 15-incher must have something appealing to win out over laptops with AMD Kaveri and Intel hardware. In our opinion, the three most promising contenders in the following list are the Asus X555LD, since it features a Core i3 and an Nvidia GeForce 820M for 400 Euros (~$454). The rock-solid HP 350 G1 with Haswell Pentium 3558U is available for 300 Euros (~$340). 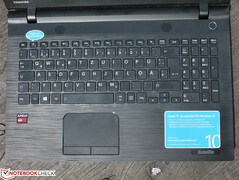 The Acer Aspire E5-521 is a cheap alternative with a Beema predecessor APU, matte display and very good battery life. "The sleek, elegant design looks simply good everywhere." These ambitious words are far from reality. Even Toshiba offers significantly more high-end, stable, and elegant mid-range and premium notebooks. Base and lid are completely from plastic. The latter has a brushed finish. 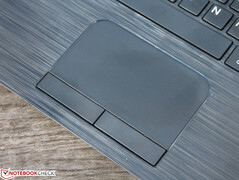 The surfaces of the lid and the keyboard side are not smooth, but grippy. Unfortunately, especially the lid attracts fingerprints and smudge. The C55D is available in two colors: matte black or matte white. The C55D does not appear high-end in use - quite the contrary. The thin base easily twists and creaks. When you grab the notebook at the optical drive, you'll notice that the top and the bottom sides give way. The underside deforms from pressure. Upon opening, the hinges pull at the base unit so much that the latter even slightly deforms. The lid bounces heavily. Thus a bumpy car or train ride is not fun with the C55D. The weak hinges are beneath a cover. As with most laptops, they cannot be called massive. The sharp edges of the base (right, left, front) are inconvenient. They separate the matte surfaces from the high-gloss strip on the sides. 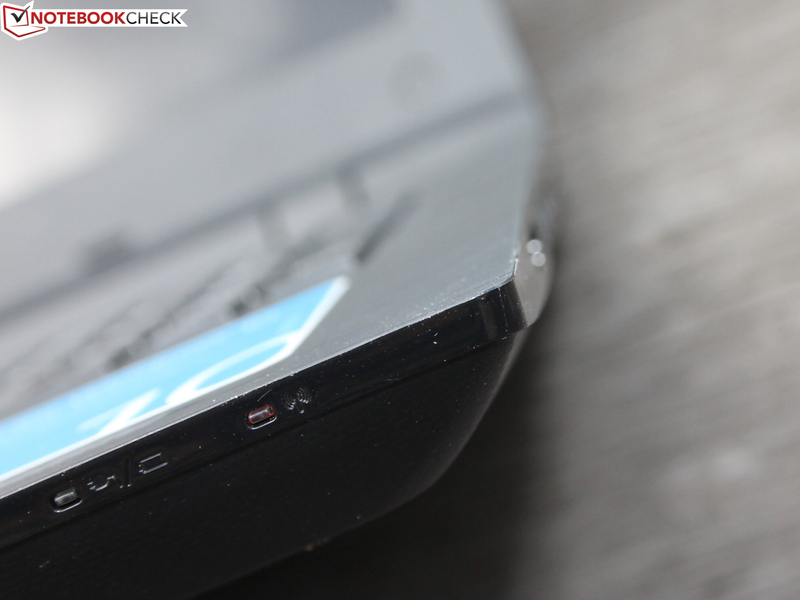 The sharp edge is not that disturbing when typing but rather when opening or closing the C55D. It is a pro that the laptop has many kinds of interfaces like USB 2.0 and USB 3.0, HDMI as well as a multi-format card reader, which supports the fast UHS-I standard. Sounds good, doesn't it? No, the Toshiba only offers the minimum standard. Only one of the three USB ports is USB 3.0. The card reader achieved a throughput of 20-40 MB/s during copying 22 GB of images and videos (SD to hard drive, min. 10.5, max. 78 MB/s). The copying took 10:30 minutes. Copying to the memory card requires 11:30 minutes at 20-30 MB/s (min. 10, max. 64 MB/s). The difference between big (video) and small files (image) is considerable. Big videos are written to the SD card at 65 MB/s, the read rate is even up to 78 MB/s when copying to the hard drive. The Satellite C55 (D)-C is available with or without optical drive. The optical drive supports M-DISC. 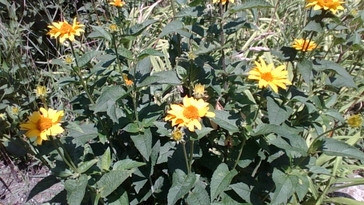 These is a form of media which is supposed to be non-aging. Two modules from Realtek are responsible for network connections. The RTL8723BE Wireless LAN 802.11n does not support Wireless-AC, but Bluetooth 4.0. The connection was stable, yet not high range. The 15-incher could not reach the 45-meter checkpoint by far. In a distance of 15 meters outside the building, Windows displays 4/5 bars. Websites open just as fast as directly beside the router in the home office. The RTL8101 (10/100MBit) does not support Gigabit-LAN, which is the current standard for cable networks - a poor performance. 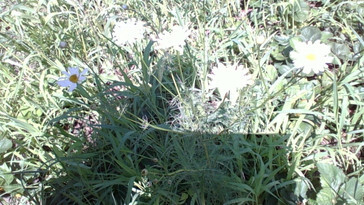 The 0.9 MP webcam (1280x720 pixels) in the display frame performs very poorly. The images provide few details, faded colors and heavy noise. In addition, bright light is quickly too much for the sensor. In contrast, the dual array microphone performs well - see speakers. Our C55D neither comes with driver CDs nor with other accessories. Certainly, there is a handy 45-Watt power adapter and warranty information in the box. Windows 8.1 is on a recovery partition. The free upgrade to Windows 10 is available for all owners of a Windows 8 or Windows 7 license and therefore also for our test model. 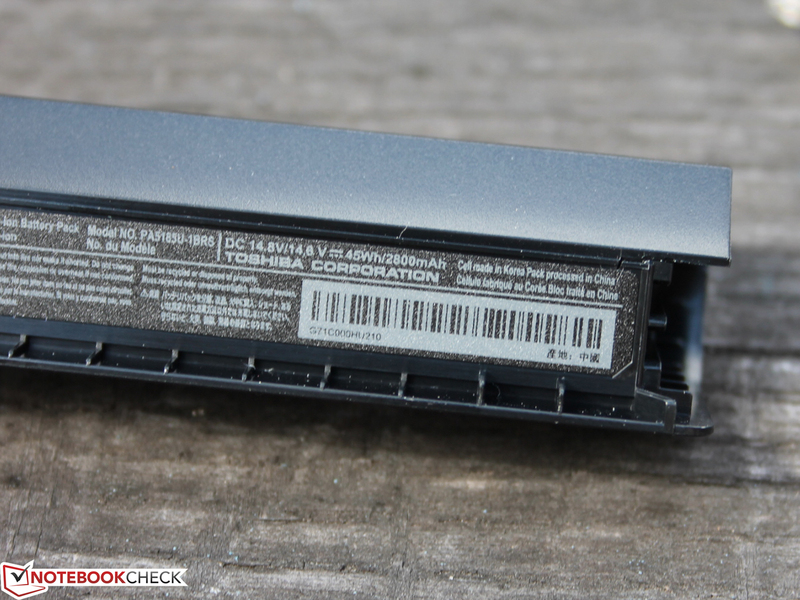 The Toshiba C55D does not have a maintenance hatch and the battery is screwed. Does Toshiba follow the unfortunate trend to sealed notebooks? 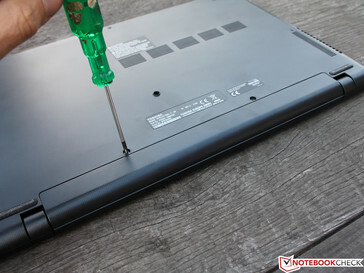 No, the battery can easily be removed after unscrewing two Phillips screws. The manufacturer simply did not go for the usual mechanism with two separate locks. This could be advantageous, since the latter can break. However, the battery does not sit firmly in the base. It wobbles in its mounting. The underside can be completely removed. Even laymen can manage this. After loosening all the screws, the plate can be lifted. In doing so, no hooks broke and we did not require a putty knife for loosening. It is possible to replace the hard drive, the RAM modules (two slots, one used), the fan (cleaning) or the optical drive. The APU is soldered. In view of the motherboard layout, there could be models with dedicated GPUs. There is an empty solder joint beside the APU. As usual for the C series, the C55D only includes a 12-month warranty. It is a bring-in manufacturer's warranty including on-site pick up service in Germany and Austria. You have to register the service case via Toshiba's notebook hotline. A warranty extension to 3 years (including pick up service in Germany and Austria) is available from 57 Euros (~$64) in the small version. The 3 years "no matter what happens" warranty including warranty extension costs 89 Euros (~$101). Thus, the one-year warranty is increased by two years. The "No matter what happens" service e.g. 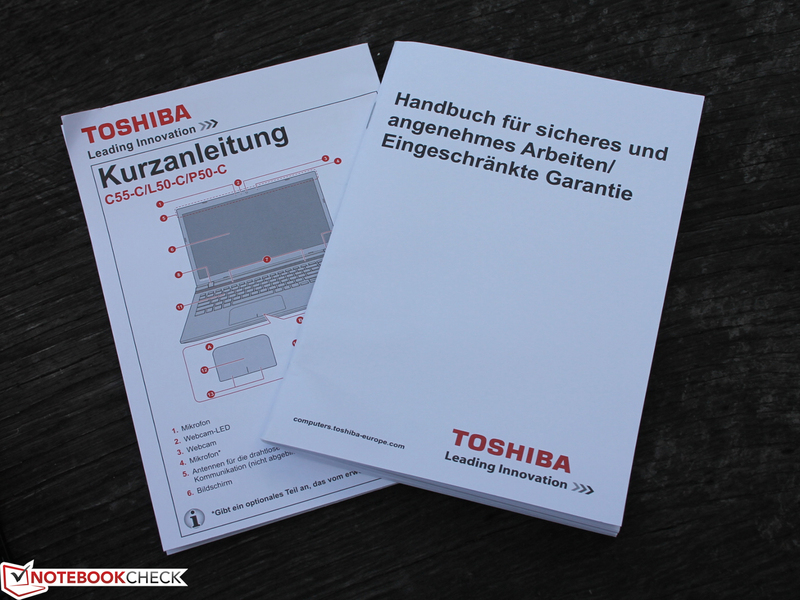 includes a replacement notebook from Toshiba in case of theft or repair in case of accidental damage. It's a kind of comprehensive insurance for the notebook. You have to activate the service within 30 days of purchase. "The frameless keyboard with isolation keys provides high typing comfort." This statement is hardly explicable. The rickety keyboard has a weak feedback because of a short key travel and a springy surface. The flat keys have a rough surface and bright, white labels. A keyboard light is not yet usual in this price class. There is a lot of space due to the isolated cursor keys and the full size number block. Even for big hands it is not difficult to hit the right keys. The function keys can be configured in the system settings. By default, the F1 to F12 keys are only available in combination with the FN key. While almost all manufacturers also incorporate ClickPads in low-cost notebooks, Toshiba uses a conventional touchpad with two separate buttons. The latter have a short travel and a difficult to trigger pressure point. Alike for the keys, the feedback is unsatisfactory. Since high force is required and the travel is short, using the touchpad is not fun and slow in usage. The touchpad has a relatively dull surface. We expect that it will be rubbed off after a while. Such worn shiny parts do not affect functionality but the look suffers. 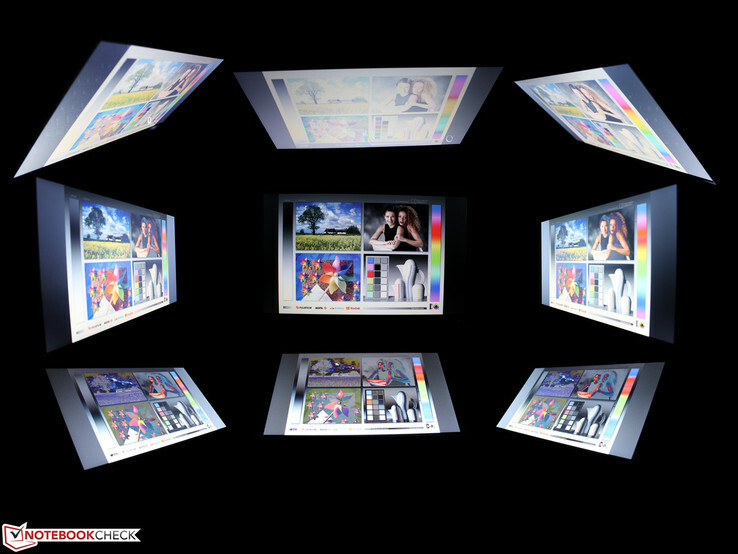 The glossy TFT has a resolution of 1366x768 (HD) pixels, i.e. 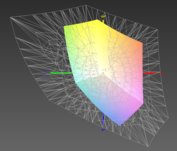 a pixel density of 112 ppi. The manufacturer does not offer other options. The LG display (LP156WHB-TPA1) with TN technology does not knock anybody's socks off. It is a low-cost model. However, the contrast is somewhat surprising. With 771:1, it is significantly higher than the competitors'. In particular the matte TFTs from the Aspire E5-521-60Y6 and the Extensa 2510-34Z4 perform poorly in this aspect. Combined with the glare-type finish, colors appear crisp and vivid. Alike most of its competitors, the HD display performs poorly in brightness (210 cd/m²). HP's 350 G1 F7Z01EA is brightest. An even brightness distribution without disturbing clouding is important, and the Satellite delivers it. A brightness distribution of 85% is above average among the test models. The test model covers 62% of sRGB and only 40% of AdobeRGB. Professional graphics and image editors will not like this display. In addition, the colors are imprecise. The DeltaE is just under 12 with a peak value of 14 (see gray levels). This is usual for cheap TFTs and the competition does not perform better. The Asus X555LD-XX283H has the lowest DeltaE, since Asus preinstalled a color profile out-of-the-box, but the 15-incher also comes with a TN panel. A color profile and calibration reduces the blue tint of the TN panel and ensures warmer and more precise colors (lower DeltaE). The DeltaE shift should be smaller than three. The blue tint typical for TN displays is especially pronounced in the Satellite and even instantly noticeable to the untrained eye (see gray levels). We linked our color profile in the box above. It significantly reduces the blue tint. The low maximum brightness makes use in the sun more difficult and the glossy surface makes things even worse. Users will inevitably have to look for a shady place. Otherwise, the display is too dark and too reflective. 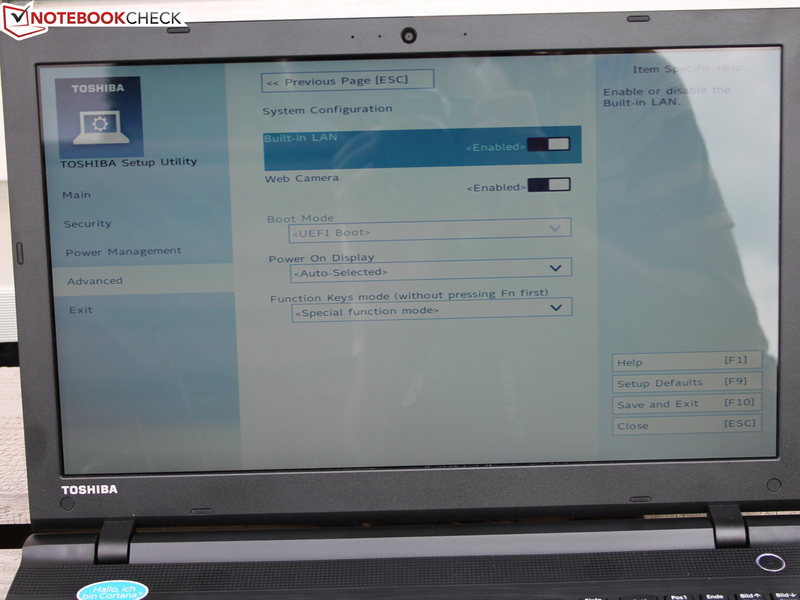 The C55D does not feature an ambient light sensor for automatic brightness adjustment. The HD panel uses TN technology. This is the cheap mainstream variant for laptop TFTs. IPS and PLS panels are gradually replacing TN displays in the mid-range and high-price segments. In the consumer range, otherwise simple laptops already feature IPS TFTs from 500 Euros (~$568). These have wider viewing angles and usually more precise colors. Our test model notably suffers from contrast shifts and image inversions if viewed from the sides or from an angle below. With the APU A8-7410 (2.2 GHz) from AMD's A series, the Satellite C55D-C-10P belongs to the entry-level laptops. But, the A8-7410 is the top model of the A-series and should be able to cope with moderate to medium user requirements. A special feature of the Carrizo-L-APU is that the TDP is manufacturer definable from 12 to 25 Watt. The OEM can adjust the energy consumption depending on whether the APU is used in a slim 13-incher or a heavy 17-incher. Models with A6-7310 (4x 2.0 GHz) and Radeon R4 are also available for about 530 Euros (~$602). A Toshiba MQ01ABD100 (1000 GB) is used for storage. 835 GB of the 5400 rpm HDD is available to the user due to a recovery partition. One 8 GB RAM module is plugged in onto the motherboard. A second module could be added. 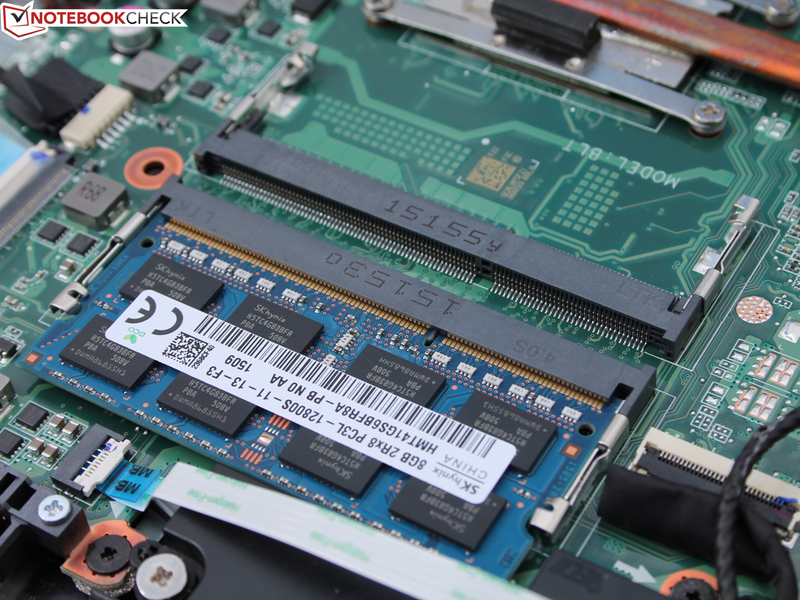 Due to a single-channel memory controller adding a second RAM module does not bring a performance gain for the graphics card. Only moving to the fast memory might bring a small performance gain. In terms of TDP, the AMD A8-7410 (12-25 Watt) is a direct competitor of Intel's Core i3-5005U with HD 5500 (Broadwell, 2x 2.0 GHz, no Turbo, Hyper-Threading, TDP of 15 W). However, in view of the price point, the Pentium N3540 (Bay Trail-M, 4x 2.16 GHz, Turbo, no Hyper-Threading, TDP of 7.5 W) comes into consideration. We use Cinebench R14 to check the Turbo when constant load is applied. The four cores of the APU should clock at up to 2.5 GHz or at least higher than the base clock of 2.2. GHz; at least during single-core load. Our Satellite C55D-C-10P is different and clocks almost constantly at just 1.6 GHz. The clock rate only jumps to 2.2 GHz for short times. In the single-core test, the defensive Turbo only changes in that it repeatedly jumps to 2.4 GHz for about a second, then it falls to 1.6 GHz for about five seconds and so on. This is not caused by thermal limits as we will show in the stress test section below. The poor usage of the Turbo range is probably the result of the manufacturer having limited the TDP to 15 Watt. As a result the performance is disappointing compared to the predecessor APU and the Intel competition. The A6-6310 is about 24% faster in the Cinebench R11.5 Multi. We have repeated the benchmarks with similar results. The single-core test is not affected (R11.5). The A8-7410 performs just better than the A6-6310 here. In the R15 multi test, our test model is 10% faster than the A6. 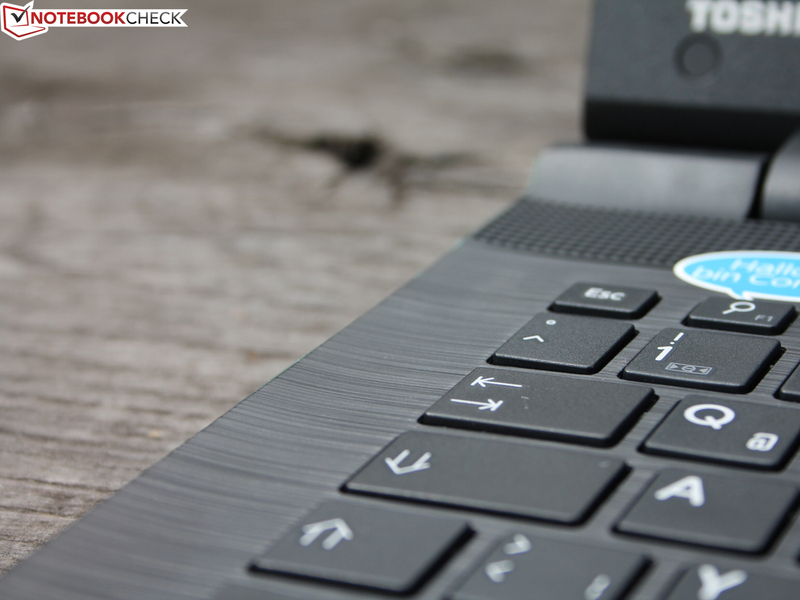 The latest Broadwell Core i3 (ThinkPad Edge E550) is the clear leader with 40%. It is faster in the multi and single-core tests. The Core i3-4030U (Extensa 2510-34Z4) is about +7% (R15 Multi) and +35% (R15 Single) better. The i3-4010U is slightly weaker and sometimes, yet not always, falls behind in the multi-core tests. Overall, Intel's Haswell Core i3 processors perform about 10 to 20% better. The Pentium 3558U (1.7 GHz), a dual-core 22 nm processor, performs worse in almost all multi-core benchmarks but almost always faster in single-core tests. Overall, they are on par (+2%). 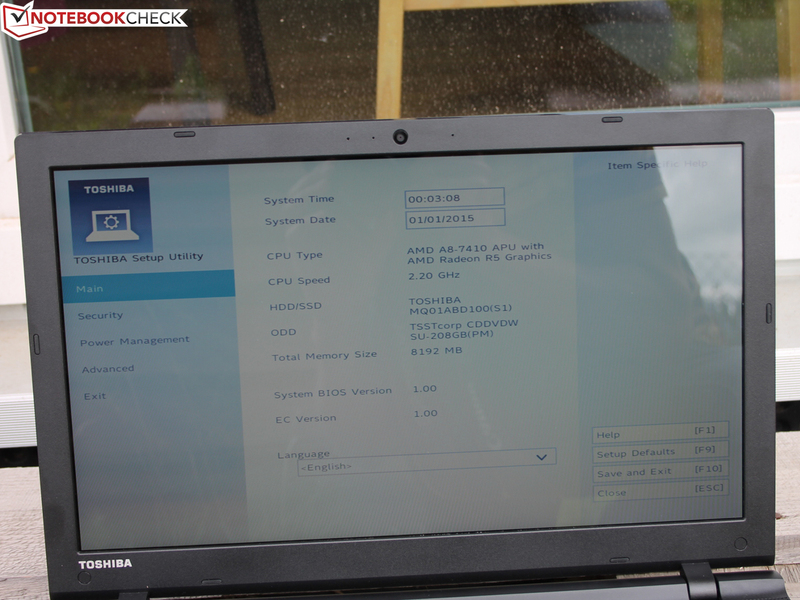 The newer Pentium N3540 quad-core (Bay Trail) performs 12% worse (Aspire E15 ES1). As a modern laptop, the Satellite should be able to play high-res videos and smoothly handle several browser tabs. But, the A8-7410 does not run a 4 K video without stuttering and the load of the four APU cores reaches about 90%. In addition, image errors occur frequently. Nevertheless, it was possible to work with other applications at the same time if not more than web surfing is required. The PCMarks 7 and 8 determine the system performance as a whole. GPU, hard drive and RAM matter here. Laptops with an SSD have a significant advantage. 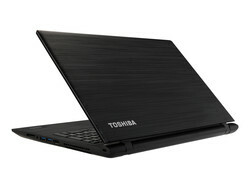 These are not in our comparison chart since they are not yet usual in the Toshiba C55D's price range. The Pentium 3558U system (HP 350 G1) takes the lead with 5%, although it performs 16% worse in PCMark 8. The PCMark profits from the slightly more powerful GPU, which we will show in the following section. Core i3 systems perform slightly better. 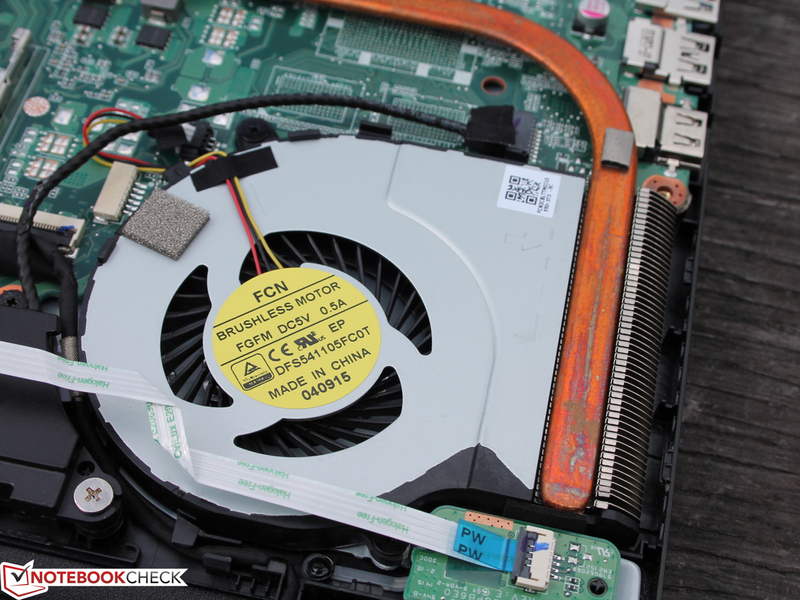 In PCMark 8, the Asus X555LD's performance is sometimes on the same level. Despite poor Turbo usage, the Satellite shows an appropriate performance here, which does not need to hide from Intel i3 systems. 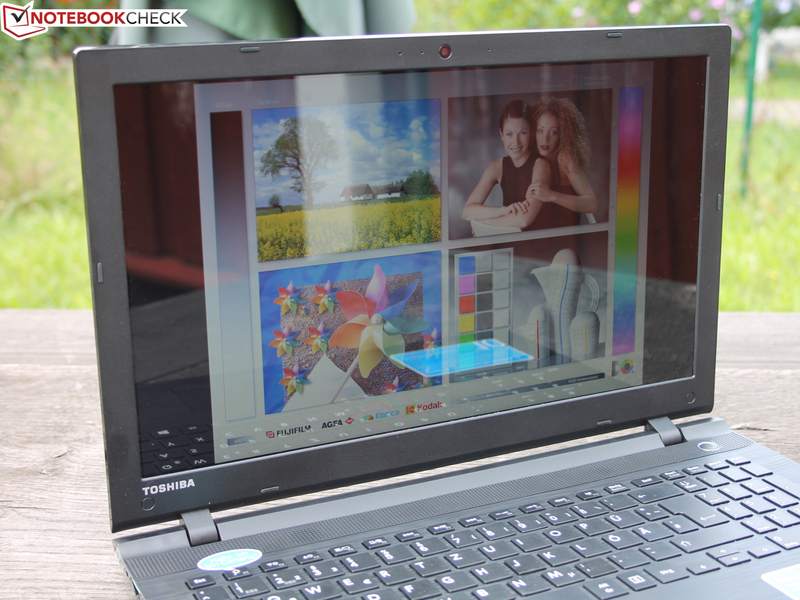 Alike in many low cost laptops, the Toshiba MQ01ABD100 houses a usual 5400 rpm hard drive. According to our table, the transfer rates are slightly below average, but they are on a usual level for such HDDs. 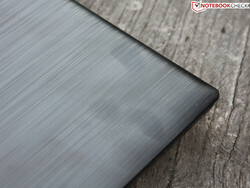 The hard drive of the Lenovo ThinkPad E555 performs slightly better because of its 7200 rpm. However, such HDDs are usually louder. The Radeon R5 (Beema/Carrizo-L) chipset GPU was already used in the A8-6410 and delivers the basics. In our test model 128 shader units (GCN architecture with two Compute Units) work at up to 800 MHz. Several 3D benchmarks attest the Radeon R5 quite a poor performance. The iGPU does not stand a chance against Nvidia's smallest dedicated solution, the 820M (+63%). Overall, the integrated Intel HD 4400 (+3%) is on par. The HD Graphics (Bay Trail-M) is easily outperformed by about 2 to 32%. Thus the Intel graphics of the Pentium N3540 cannot rival the Radeon R5 (Carrizo/Beema). However, it does not need to, since it has a lower TDP of only 7.5 Watt. It's a pity that the Radeon R4 (Beema) proves to be about equally powerful. This again hints on the fact that Toshiba does not completely use the potential of the APU. The restricted R5 is even outperformed by a faster Radeon R4 in games (Tomb Raider). The weak performance appears to be a bottleneck here. The Satellite C55D-C-10P cannot be called gaming capable, which is shown by the very red chart with six test games. Only the not that hardware demanding Tomb Raider from 2013 runs smoothly at lowest details, which is 1024x768 and not the native 1366x768 pixels. The details for Tomb Raider show a faster Radeon R4 (+12 and 51%). The higher the details, the more the restricted APU slows down the game. The charts also list the Radeon R5 M240 (HP 355 G2, A8-6410), i.e. AMD's smallest dedicated GPU. It performs much better than our Satellite with a performance gain of 80 to 90% depending on the game. Those who want to run games smoothly for lowest cost should consider the R5 M240 in the price range below 400 Euros (~$454). 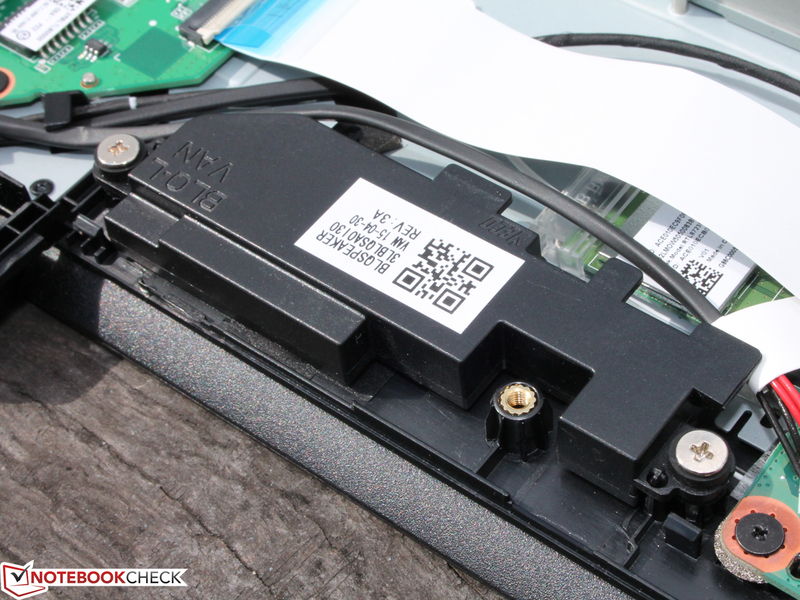 The HP 355 G2 only costs 280 to 350 Euros (~$318 to ~$397), but beware of slower AMD A4-6210 variants. While the GeForce 820M performs better in games, devices with this GPU cost at least 400 Euros (~$454), since they usually come with Intel SoCs. Information about the requirements of many other games is available in our tech section. The fan of the Satellite runs almost permanently while idle. Thus, the device is not silent at all. At least the noise of the hard drive remains constant and produces 32.3 dB(A) according to our measurements. In view of the Satellite C55D-C-10P's poor performance, the 15-incher generates a loud noise of 44 dB(A). This is too loud for a notebook with a weak and, on top of that, restricted APU and without a dedicated graphics card. However, the maximum noise is only forced during the quite unrealistic stress test with Prime95 and Furmark running simultaneously. Here, the fan works at constant speed. During our 3DMark benchmarks, the cooling system gets only slightly louder with 34 dB(A). The competitors are similarly loud. The differences are only significant in the maximum stress scenario. Acer's Extensa 2510-34Z4 is exemplary. The simple 15-inch office laptop with its Core i3 is even just audible during the stress test and the fan is often switched off while idle. While idle, the test model remains quite cool. The average temperature is just 31 °C on the top side. However, this can vary depending on the room temperature. When high and especially permanent load is applied for several hours, we measure just under 40 °C (top side) and 43 °C (underside) at the hotspots. These are the stress test values, which show the maximum temperatures. Such high temperatures are not to be expected during normal home use. During the stress test (Prime95 & Furmark 1h), the C55D behaves as follows in mains operation: First, the CPU clocks at 1.6 GHz, but the A8-7410 throttles immediately again. 64 °C at the APU is not critical. This cannot cause throttling. At the same time the Radeon clocks constantly at 800 MHz and does not throttle. (±) The average temperature for the upper side under maximal load is 34.3 °C / 94 F, compared to the average of 29.4 °C / 85 F for the devices in the class Office. (±) The maximum temperature on the upper side is 40 °C / 104 F, compared to the average of 33.9 °C / 93 F, ranging from 21.2 to 62.5 °C for the class Office. (+) In idle usage, the average temperature for the upper side is 30.7 °C / 87 F, compared to the device average of 29.4 °C / 85 F.
(-) The average temperature of the palmrest area of similar devices was 28.2 °C / 82.8 F (-8.3 °C / -14.9 F). "From strong bass to crystal-clear language - sound, every voice, each sentence and each melody are even more precise and realistic." What Toshiba speaks highly of does not match our impression of the audio quality in the test. The speakers sit above the keyboard. However, the sound is not worth listening to. The speakers rattle and roar especially at maximum volume. The Satellite comes with the usual mid-tone-heavy speakers. This might be sufficient for voice chats, but we would recommend using headphones or speakers in the 3.5 mm headphone jack. In contrast, we were quite pleased by the recordings of the stereo mic (beside the webcam). While there is a significant reverberation, speech is recorded clearly. The speaker can be 50 cm in front of the Satellite or even at a distance of 2 m. The sound level is almost constant in the recording. The power consumption is appropriately low for the category. However, we would have expected lower values in view of the above mentioned APU throttling to 1.6 GHz (stress test, normal load). For example, Acer's Extensa 2510-34Z4 is even more frugal under load. It also throttles (1.2 – 1.3 GHz), but throttling only occurs during the stress test and not during normal CPU load. The HP 350 G1 is about on par, although it is slightly more frugal with a TDP of 7.5 Watt. With the screwed 45-Wh battery, the C55D achieves a good battery life of four hours in the Wi-Fi test and above eight hours while idle with minimum brightness and flight mode. The Intel competitors, the Asus X555LD (37 Wh), the HP 350 G1 (40 Wh) and the Acer Extensa 2510 (56 Wh) can keep up quite well or perform even better. Especially the Extensa stands out positively with 391 minutes in our previous WLAN test, which is due to its significantly higher battery capacity. We usually test the battery life by playing a DVD video. This time, we ran a 1080p video from the hard drive. The looping video stopped after above four hours (281 minutes). The brightness was reduced to 150 cd/m² (dimmed 2 levels) and flight mode was active. 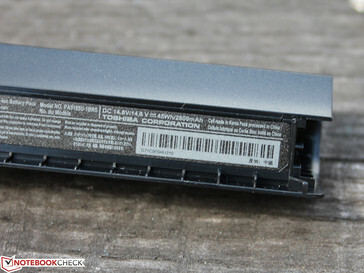 The battery is screwed, but it can be easily removed. The Toshiba Satellite C55D-C-10P (Carrizo-L) is a simple 15-incher for 600 Euros (~$682), which is too expensive in our opinion. With Carrizo-L, AMD competes with Intel's Haswell Pentium, Bay Trail-M and simple Core i3. 15-inch laptops with these CPUs and without dedicated graphics cost between 250 and 450 Euros (~$284 and ~$511). 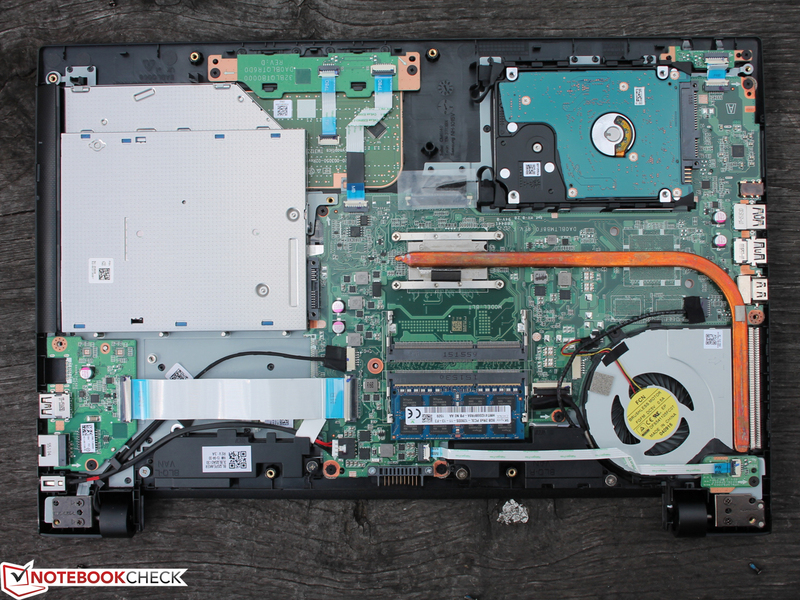 In the end, the laptop houses a relatively weak APU which can only outperform the Haswell Pentium by a few percent. A Core i3 is significantly faster and its integrated HD 4400 is just as fast as the Radeon R5 in our test model. Thus, Toshiba's Satellite C55D-C-10P is definitely too expensive, especially since the manufacturer does not use the maximum performance of the Carrizo L top model. The performance of the Satellite C55D-C-10P is not suitable for its price segment, especially since the 15-incher also does not offer special components, interfaces etc. Apart from the quite decent contrast of the very glossy TN display with narrow viewing angles, the Satellite offers nothing which cannot be found in almost all significantly cheaper 15-inch notebooks for 350 to 400 Euros (~$397 to ~$454). In view of the current price, we would not recommend buying it. Competitors like the Acer Extensa 2510-34Z4, the HP 350 G1 or the Asus X555LD are more recommendable since they are significantly cheaper. We are excited to see whether the next test models with Carrizo-L have the same Turbo flaw or whether Toshiba used the configurable TDP at the expense of performance. The review of the "bigger" sibling, the Satellite C70D-C-10N (A4-7210), will follow soon. 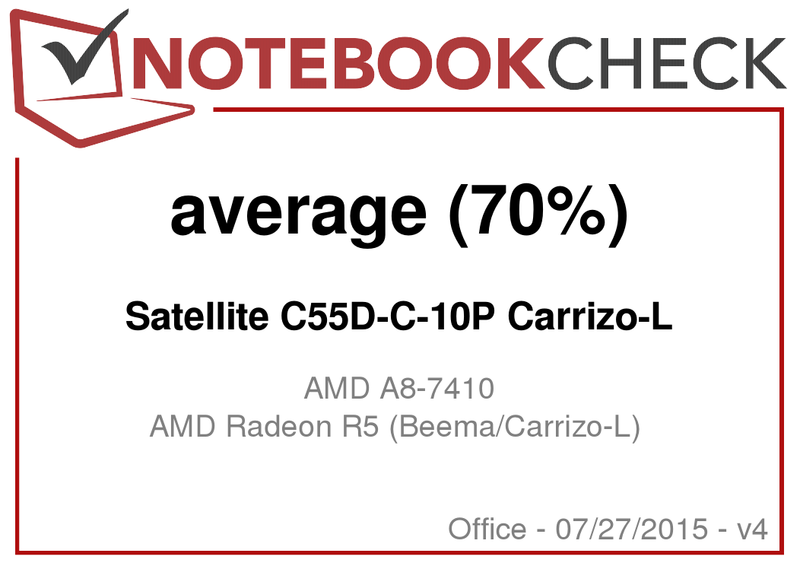 An in-depth analysis of the Carrizo-L notebook platform is available here: Analysis and Benchmarks of the AMD Carrizo-L notebook platform.